There are numerous places to turn for decorating inspiration. The internet, television and home decor magazines are excellent resources. One of the best resources for design inspiration is nature. This is especially true if you have chosen a rustic decor for your home. Whether you browse through books with exquisite nature theme photography or take notes while on a nature walk, you will find that natural settings offer an abundance of inspiring color schemes for your home decor. Make a list of the colors that you are drawn to and use those as a starting point for your room design. 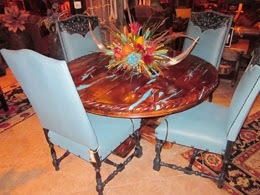 Generally, the goals for dining room furniture are function, comfort and durability. Custom furniture can meet all of those goals and more. As you begin planning your dining room design, you can click through now to get some information on the benefits of choosing custom rustic furniture for your dining room and other areas of your home. Textures play a role in all decors, but they seem to come into play in a more dramatic and noticeable way in a rustic decor. Once again, turning to nature for inspiration regarding material choices for rugs and upholstery will help you achieve a cohesive decor. A rustic style dining room will have visual warmth from the wood furniture. You can create the atmosphere you desire in the room with the wall art, lighting and decorative accessories you incorporate into the decor.